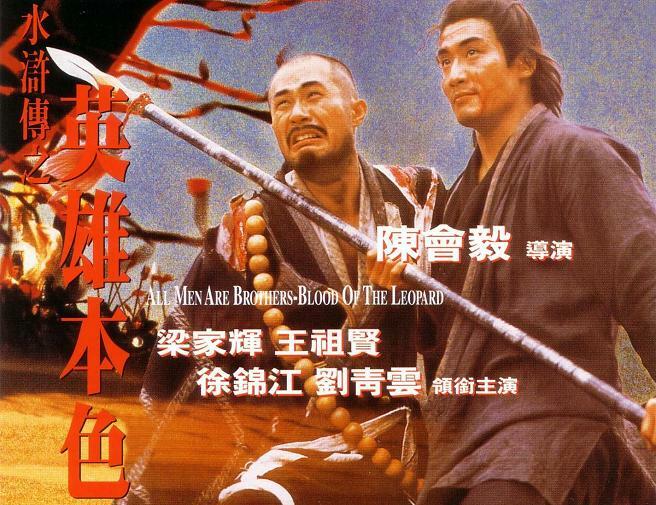 From the 1990s comes this film based off the Chinese Classic The Water Margin. It covers the meeting of two of the heroes Li Chung and the monk Lu Chi Sum, and the downfall of Lin Chung at the hands of corrupt nobles at court which leads to his outlawing. In this thrilling adaptation of the classic Chinese novel The Water Margin, Lin (Tony K.F. Leung) is the military instructor of the Imperial Guards — a crack fighting outfit. Sensing a diamond in the rough, Lin befriends Lu Chi Sum, an obnoxious monk with superb martial arts powers. But when Lin is framed by the double-dealing court officials, he must join Lu in exile long enough to plot a vengeful return. The early part of the film establishes Lin as a character and shows how good he is at martial arts, yet how he is noble and honest. But there’s one problem, being a martial artist he’s obsessed with training, despite the wishes of his wife that he should calm down and spend more time doing other stuff. Then one day he meets Lu Chi Sum (a wandering martial artist) at the market, they fight, and then stop to talk. 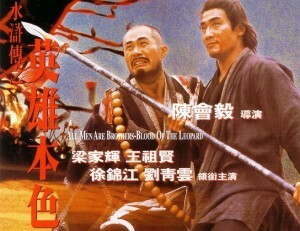 There then follows a fine “Bromance” between the two kung fu heroes, as Lu Chi Sum comes to live with Lin, and they are sparing literally 24 hours a day, smashing up pots, breaking through walls much to Lin’s wife dismay. Lu Chi Sum finally leaves when his wild nature gets him in trouble with the authorities. The film then .switches to the down fall of Lin at court at the hands of the dim witted but corrupt son of the Prime Minister. It ends on a real low with Lin outlawed swearing vengeance on his tormentors. This was very much a film I watched on a whim, being linked from some trailers I was watching on YouTube. Its not up to the production standards of modern releases, and at times almost feels like a TV movie, but the fight scenes (which are numerous) are well up to standard and the storytelling while predictable (which I why I felt no qualms detailing it above) is full of character and good acting. For some its Wizard of Oz. For others it’s Die Hard which brings them Christmas cheer. Me I’m not one of them, I like my Christmas tales filled with Kung Fu action of the Hong Kong variety. It was the UK’s Channel 4 that introduced me to Hong Kong Action movies in the 80s with a short session of Chinese Ghost Stories, which featured Sammo Hung’s classic Spooky Encounters. Since then the Christmas holidays have always been a time to catch up with new releases and discover old classics. Kung Fu Hustle (which I got as Christmas present), a season of Bruce Lee’s films (other than Enter the Dragon), Donnie Yen’s Ip Man films, Jet Li in the Once Upon a Time in China films and John Woo’s fantastic four hour version of Red Cliff, are films that immediately spring to mind. This christmas holiday I’ll be doing my usual Kung Fu fest, so come join me as I quickly review what I watch over the festive season. There will definitely be some Monkey inspired stuff, Stephen’ Chow’s excellent Journey to the West Conquering Demons is on the watch list and I’m hoping to make a trip to the cinema to see the newly released Surprise: Journey to the West. 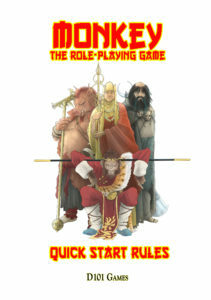 This character generation example follows the new character generation method of five story steps. At the end of each story Step, you assign game objects to the character. Game Objects are their Attitudes, their Proffesions, which tell you broadly what skills they have, and Magical Powers/Tools. Finally you play out an Action, in the form of a challenge to the characters. Cards may or may not be pulled to resolve the action, but if you do you use the Game Objects which are already written down. Other players sit back and listen, but what we found useful in so far to explain why the group was together was for other players to mention their relationships to the others characters ofstage. For example after the first character told their story of what they did in heaven, the other players mentioned that first character in their stories. The four elements acted upon a stone egg, and from it a Stone Monkey was born! He joined a tribe of Monkeys who he meets shortly after. One day the tribe came across a huge waterfall cascading down a mountain. They were curious. The cheeky stone Monkey, suggested that whoever could jump up to the top of the mountain and see what was there would become king of the tribe. Several large apes tried, but only the Stone Monkey succeeded and became their king! After a while Monkey realised that like all mortals he would grow old and die. This made him sad.One of the Elder Apes seeing the normally exuberant Monkey depressed asked him what was wrong and after Monkey admitted his troubles he suggested that Monkey find a wise Taoist Sage to teach him the arts of immortality. Therefore after travelling the world of mortals he meets the Patriarch who taught him the Taoist magical arts. Monkey gained his religious name “Sage aware of Vacuity”. Predictably the cheeky monkey got in trouble with the Patriarch, and Up in heaven the wise Planet Venus, advisor of Celestial Jade Emperor, took notice of the rise of power of Monkey on Earth and decided it would be a good idea to invite him up to heaven to keep a closer eye on him. Once in heaven The Great Sage of Vacuity was given the position of looking after the Jade Emperor’s horses. There he is given the name “Great Sage Equal to Heaven”. Eventually Monkey realised that he had been given a position of little importance and run amok in heaven as a result. The Jade Emperor sent his heavenly armies, led by the demon hunter General Li,the Pagoda Throwing General, and his son Prince Natha to subdue the rebellious Monkey. But alas they were soundly defeated and Monkey was only calmed when the Planet Venus offered him the position of guarding the Peaches of Immortality in the Queen Mother of the Western Heaven’s garden. Second Profession: Taoist Sage (from his studies with the Patriarch, although I could quite have easily picked Rogue for his lazing about in Heaven). One day while lazing around the Peach Garden, Monkey casually remarked to the Planet Venus that a guard such as he should have a great weapon to perform his duties. Thewise planet suggested that he visit the Dragon King of the ???? Ocean, who had a great store of magical weapons. Once there the Dragon King eventually showed Monkey the Great Iron Staff of the Pole Star, which could shrink down to the size of a needle or expand to vast size, and being made of star metal was very heavy. Monkey successfully lifted the staff as if it was weightless, and despite protests from the Dragon King took it as his own. Magical weapon: The Iron Staff of the Pole Star stolen from the Dragon King of the ???? Ocean. Eventually the Dragon King arrived in Heaven to protest the theft of the Iron Staff, and Monkey was sent to King Yama’s realm, the 12 Hells where the dead go, as a punishment. Monkey managed to trick his way out by sneaking out of the Hells and erasing his name from King Yama’s book of the dead, which holds the name of everyone who is dead and the time and manner of their death. 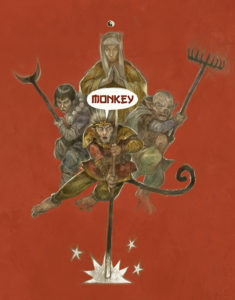 Just for the fun of it, Monkey also erased the names of several elder monkeys from Water Cave Mountain. Eventually Monkey got in trouble again, this time for eating the Peaches of Immortality just as they had finished their thousand-year ripening and were expected at Queen of Western Heaven’s party. Once again rather than take responsiblity he runs amok in heaven. This time he is subdued by Buddha who hears the sounds of mayhem from the Eastern (Buddhist) Heaven and decides to come over and help his friends in the Western Heaven. He tricks the egotistical Monkey into racing to the end of the Universe,where Monkey graffiti on four pillars, and Back, when in fact he never left Buddha’s hand, as proven by the graffiti on Buddha’s four fingers. Buddha then imprisons him under a mountain, saying that he will stay there until a Buddhist Monk comes along who needs his help and who will redeem him. Heaven, and ordered you to learn humility and manners on Earth. Step 5 Monkey is imprisoned on Earth. Monkey’s final Profession: Rogue, despite Monkey not doing a great deal while trapped under the mountain (Prisoner) would be a dull choice, so for his final profession we are going to choose one that is in keeping with his actions that got him there. *Being of Animal origin Monkey relies a bit more on his natural instincts, which means his Professions below have slightly lower values, but to compensate has a dominant attitude which gives double the card bonus during Actions. Monkey also wears a Golden head band that was placed there by the Goddess Kuan Yin, the Goddess of Mercy, so that Tripitaka can use to force him to behave by invoking the Headache Sutra, which causes the headband to painfully constrict.